Navigate: Home / Brands / SPSS / IBM SPSS Statistics Standard Grad Pack 25.0 Backup DVD - What's This?. 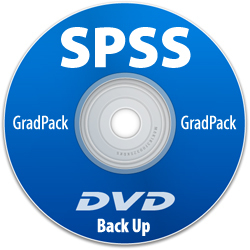 Get a Back-Up DVD of SPSS GradPack mailed to you. This will allow you to easily re-install the software should you get a new computer or have any issues. It's only $9.95 including shipping. Note: Back-Up DVD does not come with a Authorization Code. You must purchase the download and use the Authorization Code that comes with the download.